Before Georgia O’Keeffe became famous for her abstract paintings of bones, flowers and desert landscapes, she went through an evolution. Part of that evolution took place in Charlottesville during the summers of 1912-1916. A new exhibit at the University of Virginia’s Fralin Museum of Art highlights this unexplored period of her life. For Virginia Currents, Peter Solomon has more. By the time she was 24, Georgia O’Keeffe was at a crossroads. Her father went bankrupt, her parents split up and her mother suffered from tuberculosis. O’Keeffe won prizes for her work while attending art schools in Chicago and New York, but she ran out of money to pay for school. Matthew McClendon is director of the Fralin Museum of Art. He says she was uninspired by the schools’ realistic approach to art and she hadn’t found her voice yet. .
Matthew McClendon: And was questioning whether she was going to really be an artist as she had wanted to be. In 1912, O’Keeffe decided to spend the summer with her mother and sisters in Charlottesville. 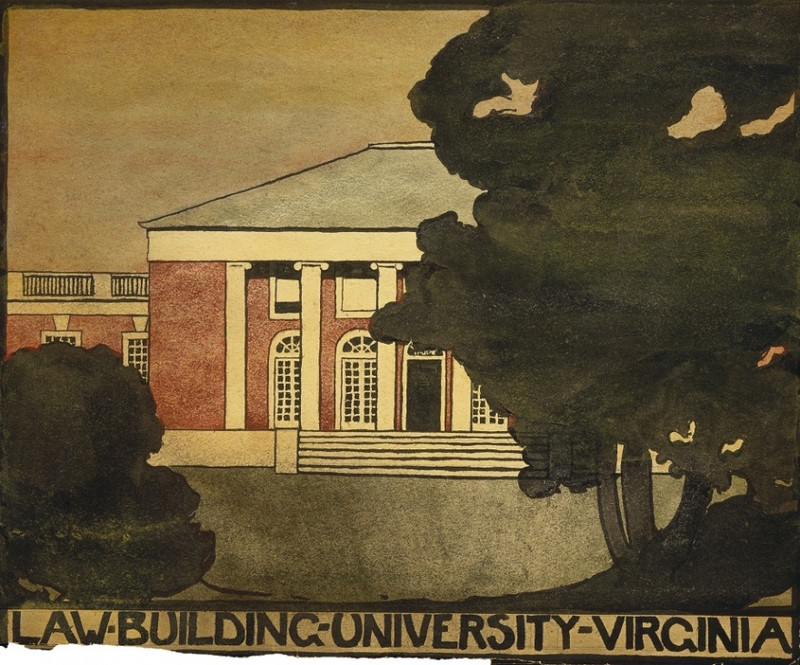 While attending lectures at UVA, she learned about Arthur Wesley Dow. Instead of teaching his students to render subjects with photographic accuracy, he encouraged them to think creatively. Making something beautiful was more important than making something accurate. In the Fralin’s exhibit Unexpected O'Keeffe, you can see the artist applying these lessons in her watercolors of campus. Elizabeth Turner: We're standing here across the street from the rotunda looking over at the grounds of the university. Exhibit co-curator and Art History Professor Elizabeth Turnerdescibes O’Keeffe’s painting of Jefferson’s rotunda. Using a handful of colors, she portrays the structure with simple lines and shapes. The abstract foliage in the foreground draws your eyes to the dome. Turner: O’Keeffe would often say, and this was rooted in the Dow method, ‘There is nothing less real than realism.’ So what she is constructing here in this watercolor is not an exact description of the setting, but rather a way of conveying her experience of looking up at this building. In another painting, O’Keeffe frames the building more dramatically with two trees that are as black as night. Other paintings include scenes of the Italianate gardens and buildings from UVA's campus. O’Keeffe painted these watercolors in a notebook that she kept until she died. Professor Turner says this was the beginning of her embrace of abstract art. Turner: On the one level, it’s a credentialing exercise. It’s notebook of watercolors that’s telling the world that she knows how to teach this Dow method. On the other hand, what she's doing in developing this composition is also assimilating and acquiring a vocabulary of shapes. Thinking about art as a language, a language of design, a language of beauty, a language of awakening and empowerment. The exhibition includes paintings inspired by O’Keefe’s expeditions to places like Humpback Rocks and Mount Elliot. The mountains are reduced to simple contour shapes, basically a few bands of color. Jonathan Chance is a recent UVA graduate who served as a researcher for the exhibition. He says the paintings reflect O’Keefe’s rapid evolution. In her later years, O’Keeffe settled in New Mexico and became known for her paintings of dried cattle bones and abstract landscapes of the arid New Mexico desert. Museum Director McClendon hopes that visitors to the exhibit will come away with a better understanding of her entire body of work. McClendon: She’s one of the most studied artists in American art history, but this is probably the last period that’s relatively unstudied in her life and most people don’t know about. McClendon adds that he really wants people, especially students, to understand that art is a process, and, like Georgia O‘Keeffe, it might take years and years of hard work and even doubt before an artist finds his or her voice. Unexpected O’Keeffe: The Virginia Watercolors and Later Paintings is on display at the Fralin Museum of Art until January 27, 2019. For Virginia Currents, I’m Peter Solomon, WCVE News. Thanks to WCVE's Travis Pope for production assistance on this story.